I didn't crack open a bit of study material this weekend. And I am okay with that. I needed to get some craft projects and general home maintenance out of my system. Hopefully I will get back to the grind this week. My poor coral wall. I have such conflicted feelings about this wall. I wanted to like it. I tried to like it. It was really such a gorgeous color, but it just wasn't right for me. It seemed like this relationship where nothing was glaringly wrong, but there was just no chemistry. So I decided to break things off before anyone got hurt. In process. I was instantly smitten as soon as the color went up. I also can't say enough good things about this Olympic Premium Zero VOC paint (in Regatta Bay). It covered that red in two coats and didn't stink at all. I only had my window cracked a bit and the there was no smell at all. Hooray for saving brain cells! We started outside but eventually had to move in because it was too chilly :( I am very ready to get hot weather here. I can't stand this in between! Later on, Stephen joined us and we eventually migrated to Hanson Dry for a final drink of the evening. I miss Fort Greene! It is such a pretty area. Finally, on Sunday, in between being a cleaning machine, I decided to paint this folding chair that I got back on this shopping spree day. Once again, I broke out the navy blue I have an unnatural relationship with. After one coat it looks pretty bad, but I have no doubt that second coat with be gorgeous. 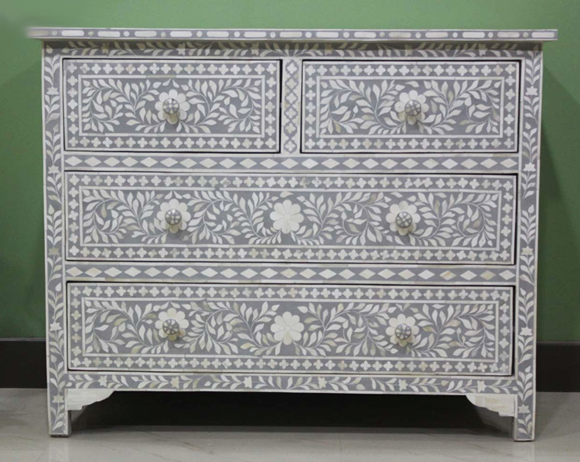 Once the blue layer is finished, I plan on going back with a pattern like this dresser, so it looks like it has an inlay detail. I am most likely overestimating my free hand paint skills, but I'm hoping a pearlescent white or grey paint pen and some light pencil construction lines will help make the process easier. And if it looks awful, I can just paint it back a solid color. Isn't paint such a fun medium?! Wish me luck! I will keep you posted on the results. P.S. - I've been listening to the Alabama Shakes Boys and Girls album nonstop this weekend. It's so good! They are from a town really near where I grew up in Alabama and are coming to Central Park in June for Summer Stages. I can't wait to see them! You did such a great job painting! The blue wall looks awesome. I am loving this blue wall. And the Alabama Shakes! AND I can't believe you saw Martha twice!!! Love the new wall color and can't wait to see this chair complete. I think you should just go ahead and make a rule to hang everything on your walls from a clothes-hanger.